Replacement foam for the Swim Skim 50. Replacement foam for the Swim Skim 25. A wall mounted skimmer for removal of leaves and debris from the pond surface. This skimmer should be built into the pond at the construction stage. Suitable for liners or concrete / fiberglassed ponds. Measures 31cm tall, 25cm deep and 21cm wide. Actual opening is 15cm wide and 14cm tall. The outlet is at the bottom and is 1.5" Female thread. Needs an Aquamax 5500 or Eco 6000 for flow. This surface skimmer has a number of convincing arguments. In addition the float automatically bridges water level differentials up to 160 mm, which can easily occur due to rainfall or strong evaporation. A small tube diameter (80mm) means less air content and thus prevents the surface skimmer from floating. Remove leaves from the surface of the pond before they sink to the bottom causing health and filtration problems. The SwimSkim 25 keeps pond surfaces up to 25 m2 free of leaves, pollen, or similar particles. An aerator function that supplies the pond with vital oxygen, is also integrated. The SwimSkim 50 keeps pond surfaces up to 50 m2 free of leaves, pollen, or similar particles. Special energy saving motor technology. 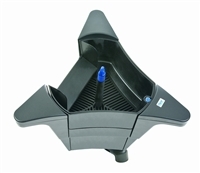 Whirlpool Function: Can be set to stir up debris from pond floor and feed into filter pump. Remove Dissolved Organic Compounds (DOC) from your pond water. Removes unsightly foam from the water surface. Conditions the water making it healthier and cleaner. 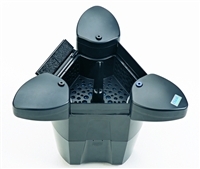 This Aqua Sure skimmer needs a pump - Aquamax 3500 or 4000 recommended.